The 2016-17 regular season is over for BU hockey, and the Terriers stand as co-champions of Hockey East. Heading into this past weekend’s series against Notre Dame, a million and one scenarios could have unfolded (that’s an exaggeration), but the dust has finally settled. BU lost, 3-1, on Friday night, only to register an inspiring, 4-1, win over the Fighting Irish on Saturday evening. With those results, head coach David Quinn’s side will be the No. 2 seed in the Hockey East Tournament. It also ends the regular season in three-way tie for first place, sharing the crown with Boston College and UMass Lowell. The stars of the weekend were forwards Kieffer Bellows, Clayton Keller Patrick Harper and goaltender Jake Oettinger. In other words, the freshmen are stepping up with playoff hockey around the corner. Furthermore, Quinn said defenseman and captain Doyle Somerby had his best weekend of the season. As things stand, BU sits in seventh place in the PairWise Rankings, so the scarlet and white are in a good place with the NCAA Tournament looming. Lastly, the Terriers won’t play again until March 10 against a to-be-determined opponent, so keep an eye out on the opening round of the Hockey East Tournament. Friday’s recap of the 3-1 loss. Friday’s sider about the goaltender battle between Jake Oettinger and Cal Petersen. Saturday’s recap of the 4-1, come-from-behind win. Saturday’s sider about Kieffer Bellows coming into his own on the third line. Quinn on his team's physicality tonight: "This isn't badminton or tennis. If you don't want to get physical go play another sport." The regular season is winding down, and the No. 6 Boston University men’s hockey team is hosting No. 13 University of Notre Dame this Friday night at 6 p.m. The game is being broadcast nationally on the American Sports Network and regionally on NESN. Per usual, we’ll be live for all the action and have stories postgame. Follow along on our live blog below and chime in with your thoughts! game against the University of Notre Dame. SOUTH BEND, Ind. — The meaning of the phrase “rebuilding year” can change depending on one’s outlook. For the negative Boston University men’s hockey fan, a rebuilding year is one that featured a lot of losses. The Terriers came in fourth place in the Beanpot, went on an 18-game stretch in which it only won a single game and, thanks to Saturday night’s 3-2 loss at No. 11/12 University of Notre Dame, did not make it out of the first round of the Hockey East tournament. There is a positive way to look at a rebuilding year for BU fans, however. The Terriers (10-21-4, 5-12-3 Hockey East) are only graduating two players who received significant playing time this season in defensemen Garrett Noonan and Patrick MacGregor, and have a whole bunch of underclassmen who used the season to get experience playing against some of the top competition college hockey has to offer. “I think one of the bright spots about having a tough year is that our young players had to play a ton,” said BU associate head coach Steve Greeley. “And because of that they’re going to be better sophomores and they’re going to help this team going forward. One of those players was freshman forward Robbie Baillargeon. The center led the Terriers in points this season with 27 – including a power-play goal in the third period of Saturday night’s loss to the Fighting Irish (21-12-2, 9-9-2 Hockey East). To Greeley, Baillargeon was one of the freshmen who benefitted most from the extra usage this season. “When he came here he was an offensive kid and all of a sudden against [the University of Vermont] in a win he is playing 30 minutes in a game and he is taking important faceoffs,” Greeley said. “He is killing penalties for probably the first time in his life. It’s not just the growth of the freshmen that will give BU a boost next season, but the addition of a large and strong recruiting class. The expected nine-man crew is highlighted by phenom Jack Eichel, who sources indicate will be coming to BU next year, contrary to rumors of him going to play Major Juniors in Canada. Perhaps the most important thing about the class is that it will provide depth. BU played several games without a healthy scratch this season, which led to the nine freshmen getting more significant ice time than they would have gotten, ideally. As BU head coach David Quinn pointed out, the Terriers had a rebuilding year in 1988-89 when it went 14-21-1. The following season, BU was 25-17-2 and back in the Frozen Four. While that does not necessarily mean the Terriers will be back to glory and raising trophies next season, it does serve as a reminder that season-to-season turnarounds happen in college hockey. With the big recruiting class coming in and the large group of returning players, anything is possible with a little patience. Moving forward, the young core of the team is getting older. BU’s top-three scorers will all be returning, and that doesn’t even include the team’s two returning juniors, forwards Evan Rodrigues and Cason Hohmann. With sophomore defenseman Matt Grzelcyk back from his shoulder injury, there is a lot of skill returning for BU. While that group of returnees does not include Noonan, Quinn’s first captain expects big things coming up for BU hockey. SOUTH BEND, Ind. — Garrett Noonan stood by the door to the Boston University bench, waiting as his teammates filed by one-by-one down the tunnel and into the offseason. It was a slow walk off the ice after a 3-2 loss to the University of Notre Dame with the Terriers in no particular hurry to get to the locker room. Only goodbyes and hindsight awaited. to the University of Notre Dame Saturday evening. Some gave Noonan a fist bump, others a hug, most a few simple words of thanks. Associate head coach Steve Greeley offered a pat on the back. 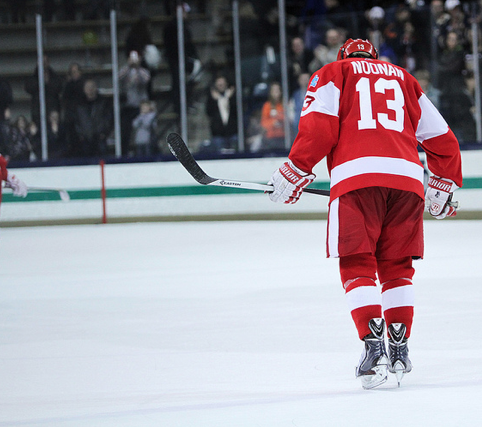 All of it served the same purpose: delaying, however slightly, Noonan’s exit from the ice, his last as a Terrier. Saturday’s loss to the No. 11/12 Fighting Irish in the first round of the Hockey East tournament brought an end to not only a disappointing season for the BU men’s hockey team, but also Noonan’s collegiate career. He almost did. Noonan, the captain, assisted freshman center Robbie Baillargeon’s power-play goal at 14:22 in the third to bring BU within one. Despite a desperate spurt of energy from the Terriers — including Noonan, who played most of the remaining 5:36 — the effort ultimately fell short. Noonan’s assist came minutes after he was hit hard into the boards and went down in the corner. He remained motionless on his stomach for several minutes before getting back to his feet and taking the next shift, a two-man advantage for BU. That sequence was, along with the post-game parade, one of the few occasions Noonan stayed in one place for an extended period of time all night. BU coach David Quinn half-joked that Noonan, who was shaken up but felt fine after the hit, stayed down to catch his breathe. Playing about 30 minutes per night wears on a guy, after all. “It’s almost inhumane what we’ve asked him to do,” Quinn said. Noonan’s senior year was by any measure a difficult one for the Terriers. Last spring, Noonan decided to come back for one more season in the scarlet and white with two main objectives: win trophies and study under the tutelage of Quinn to become a better defenseman. BU missed on the first one, finishing at 10-21-4 and in ninth place in the conference, its worst since Hockey East’s inception three decades ago. But that second goal? Ask any of the parties involved and they will give rave reviews. Noonan’s game has evolved dramatically from his 16-goal, 11-assist campaign in 2011-12, back when he was a sophomore regularly sneaking up the wing and banging home back-door goals. This season’s circumstances forced him into a different role — one with much more defensive responsibility for a young Terrier team that lacked depth as much as it did experience. Noonan tallied four goals and 15 assists to go with his immeasurable defensive impact. Noonan agreed that he achieved what he had wanted to accomplish with Quinn on an individual level. It might not be too long until Noonan takes to the ice again, but next time it will be as a professional. Noonan will likely sign with the Nashville Predators — who selected him in the fourth round (112th overall) in the 2011 NHL Entry Draft — sooner rather than later. When the ink dries on that contract, Noonan will keep with him plenty of lessons from his time on Commonwealth Avenue — time that has meant a lot to the Norfolk native. SOUTH BEND, Ind. — Garrett Noonan lay on the ice nearly motionless. After taking a hit from University of Notre Dame defenseman Stephen Johns, the senior captain of the Boston University men’s hockey team needed a minute to gather himself and catch a breath. The Terriers (10-21-4, 5-12-3 Hockey East) were down 3-1 with fewer than seven minutes left in the game. Notre Dame forward T.J. Tynan battle for the puck. Noonan, despite being rattled from the previous play, returned to the ice, epitomizing the resilience of the entire team. 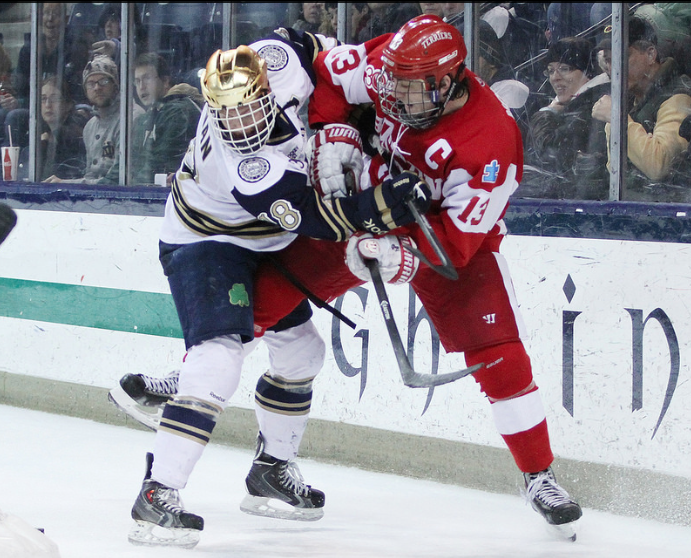 In the end, though, ninth-seeded BU’s effort fell just short as the eighth-seeded Fighting Irish (21-12-2, 9-9-2) defeated the Terriers 3-2 at Compton Family Ice Arena in the opening round of the Hockey East tournament Saturday evening. For the first half of the game, the Fighting Irish started exactly where they left off two weeks ago, scoring two goals and shutting down BU’s offense. Notre Dame initially got on the board after center T.J. Tynan pickpocketed sophomore defenseman Ahti Oksanen in BU’s zone. Tynan, who brought the puck over to the left circle, then sent a pass to his linemate, Bryan Rust, on the right side of the goal. After deking around sprawled-out BU goaltender Matt O’Connor, Rust flipped his shot into the left side of the net. After the goal, the Terriers had two power-play opportunities — including one that carried over into the opening seconds of the middle frame — but the team failed to even record a shot with the man-advantage. “You can feel it deflate the bench,” said BU coach David Quinn. “I think that’s happened to us over the last month because our power play has not been good. Not only has it not produced from a numbers standpoint, we haven’t looked good on it. Having failed to convert on the power play, the Terriers needed to fend off the Fighting Irish after BU registered two penalties over the course of a three-minute span. Seconds after the team killed off the second penalty, though, Notre Dame increased its initial lead after left wing and captain Jeff Costello sent a shot from the right circle that went through O’Connor’s five-hole. The score mirrored the previous meetings between the teams where the Fighting Irish defeated BU 2-0 in back-to-back games. The similarities ended with fewer than four minutes left in the frame, though, when junior wing Evan Rodrigues found the back of the net, snapping the team’s scoreless streak against Notre Dame goaltender Steven Summerhays that had lasted roughly 155 minutes. After putting multiple shots on Summerhays near the crease, Rodrigues finally broke through when he picked up his own rebound and notched it into the left side of the goal, making it a 2-1 game. While that goal gave the team confidence, according to Quinn, it did not last for long as Notre Dame once again took a two-goal lead over the Terriers in the opening minutes of the third period. As the game neared its end, though, the Fighting Irish gave BU an opportunity. With wing Mike Voran already in the penalty box for tripping, Johns hit Noonan, giving BU a 5-on-3 advantage for 51 seconds. Although Noonan originally came off the ice with the help of a trainer, the defenseman stayed on the bench and eventually made his way back on the ice during the ensuing power play. With the Voran penalty having come off the clock just 11 seconds earlier, Noonan sent a pass over to freshman center Robbie Baillargeon, who bounced his shot off the back of the net, making it a one-goal game once again. Despite pulling O’Connor for the final 1:19 of the game and a breakaway chance by freshman wing Nick Roberto, though, the Terriers could not complete the comeback. As the final buzzer sounded, Noonan and several other Terriers glided down toward their goal hunched over with their season — and for some of them, their BU careers — having just come to an end. “I think we’re all crushed,” Noonan said. 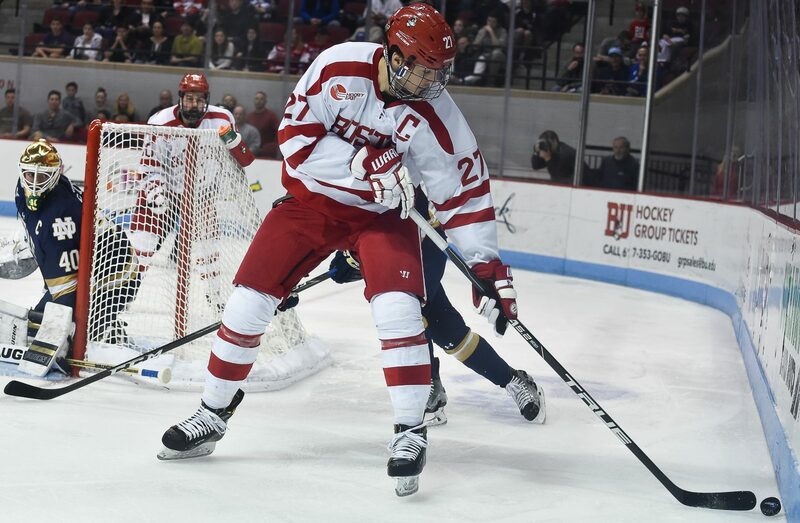 For just the second time this season, the Boston University men’s hockey team will enter a weekend with a chance to win three consecutive games. When the Terriers take to the ice Saturday though, they will have more pressure on them than just starting a streak as they take on the University of Notre Dame in a single-elimination game at Compton Family Ice Arena in South Bend, Ind. The Terriers (10-20-4, 5-12-3 Hockey East) start the first round of the Hockey East playoffs after a weekend of firsts – the first time they swept a team this season and the first time they won a game on the road. The team accomplished those feats in the home-and-home series with Northeastern University despite benching several players over the course of the two games because of a violation of a team policy. “I think we started to play some winning hockey,” said BU coach David Quinn. “There is a difference between playing well and playing winning hockey, and I think we did the things you need to do to win more often on Friday night and Saturday night than we have in the past. If there is one player who has been asked to do it all this season for the Boston University men’s hockey team, it is senior defenseman and captain Garrett Noonan. In every situation, whether it is a power play, penalty kill or key moment at the end of the game, Noonan has been called upon to do the job. With sophomore defenseman Matt Grzelcyk injured and a thin group of defensemen left over, Noonan has logged significant minutes this season. He is a minus-12 on the season, but 11 of those goals have come in situations when BU (10-20-4, 5-12-3 Hockey East) has pulled the goalie.